A team of enthusiastic greeters helped new students find their way around campus and move into the residence halls. These volunteers also helped students carry their belongings into their new homes. 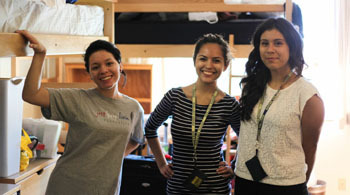 New roommates said hello and got to work furnishing their dorm rooms this week at Oakes College. New students and their families flocked to UC Santa Cruz this week, bringing lava lamps, toiletries, enormous cartons of Sprite and Aquafina, and Rubbermaid containers large enough to contain an entire person. It was all part of the annual move-in ritual at UCSC. About 4,300 new undergraduate students are expected when fall-quarter classes start up again on Thursday, September 26. The move-in continues through Sunday, September 22. Expect to see more students making their way across campus, clutching boxes of toothpaste, Advil and Alka Seltzer, dozens of artificial roses to brighten up the rooms, and posters to cover up every inch of wall space. Campus Provost/Executive Vice Chancellor Alison Galloway was on hand – as she is every year – to greet students and help with the move-in. So was a small army of volunteers who made sure students boarded the correct shuttle buses. A few of the greeters held “welcome” banners, drawing waves and honks from every passing motorist. Students moving into Oakes College over the weekend took advantage of a full menu of activities including a showing of the recent Pixar hit movie, “Monsters University,” an art party, and a “bonding" fire, featuring horchata and free s’mores. Others planned to embark on a night hike on campus, and take part in a walking tour of downtown Santa Cruz. Everywhere you looked at Oakes, emotional hellos and goodbyes were taking place. Parents – a large number of them whose children would be the first to attend a four-year university – wished them luck, while roommates met for the first time. Guadalupe Munoz, 18, lives much closer, in Morgan Hill. Still, the occasion was dramatic for her and her family. She is the first in her family to attend a four-year university. While she admitted to being nervous about living away from home, she was also very excited. “I want to set a good example for my nephew,” she said. Of the new undergraduate students, 3,300 will be new freshmen and 1,000 new junior-level transfers; with nearly 98 percent of transfer students coming directly from California's community colleges. Cabrillo College accounts for the largest number of transfer students with 144 joining the campus this fall. Almost 40 percent of the 2013 freshman class will be comprised of students from ethnic backgrounds that have been traditionally underrepresented within the UC system – African-American/Black, American Indian/Alaskan Native, and Hispanic ethnicities.The 39.8 percent is slightly higher than last fall's 39.2 percent, continuing an upward trend. Fall 2011's class included 33.9 percent of students from underrepresented groups.